Two weeks ago, I saw ‘Blackfish’, the fascinating new documentary about killer whales in captivity. Here’s the trailer. I enjoyed the movie, but it left me with questions. A lot of questions. Neuroscience questions. What makes whales different from other animals? How do whales perceive humans? What did the filmmakers mean when they said that killer whales have a wide range of emotions? How smart are these animals, really? Read the interview in French here. So I called up Lori Marino, a neuroscientist prominently featured in ‘Blackfish’, and asked her to satiate my curiosity. In this interview, Marino and I switch around between referring to whales, killer whales, orcas, and cetaceans. For the record, cetaceans = an order of marine mammals. Whales are cetaceans. So are as dolphins and porpoises. Killer whales (a.k.a. orcas or blackfish) are a type of cetacean. You’re currently a professor of cetacean neuroscience at Emory University and have worked in the field for over 20 years. What drew you to study this subject? In grad school, everyone was studying primates. I wanted to study another animal — a group of species that were comparably intelligent, but we knew relatively little about. I started to look up dolphins and whales. When I saw a picture of the brain of a dolphin in a book, I was hooked. I thought, “Wow. This is really something.” And we knew very little about the brain of a dolphin or a whale 25 years ago, so I saw this as an opportunity. It seems like it would be more difficult to study a whale brain than, say, the brain of a rat or a monkey. Are there special challenges to studying the brain of an animal that’s so large? Yeah, it is more difficult, because the brain itself is so different from any other mammal brain. That’s part of what hooked me: the idea that this a very big brain. It was just put together differently than other mammal brain. Magnetic resonance imaging, or MRI, is a device that allows scientists to look inside the body. MRI uses radio waves to create a 3D picture of a given area. The other difficulty is, because it’s so large, it’s not easy to use the same techniques that you use with small brains. It’s much bigger than even the largest non-human primate brain. The dolphin brain is even bigger than the human brain. It’s very difficult to study. But once we were able to use techniques like magnetic resonance imaging, that’s when things really took off, because we could take the brain, put it in a scanner, get the digital images in 3D, and do what we could normally do dissecting any other brain. … MRI really opened up the field. What are some characteristics that set killer whale brains apart from human brains? In ‘Blackfish’, you and the other scientists mention that a particular area of the orca brain is enlarged. If you look at the limbic system — the emotion-processing area in all mammal brains — you find something really interesting. There’s some parts of the limbic system of dolphins and whales that have changed and actually gotten smaller, but there are other parts of it that are adjacent areas that are much larger and more elaborate than in the human brain. That area is called the paralimbic region. So they have like an extra lobe of tissue that sort of sits adjacent to their limbic system and their neocortex. And, you know, you can infer from that. That lobe has something to do with processing emotions, but also something to do with thinking. It’s very highly elaborated in most cetaceans and not at all or not nearly as much in humans or other mammals, so it suggests that there’s something that evolved or adapted in that brain over time that did not occur in other mammals, including humans. In the movie, this is said to be a sign of a range of emotions that possibly outranks that of humans. If you look at, say, the brain of an orca [and] the brain of a human, it would be difficult to say that the human brain was capable of more emotional depth than the orca brain, because — again — what you see in the orca brain is an elaboration on the limbic area that the human brain doesn’t have. So if that part of the orca brain is doing what it should be doing, as it does in all mammals — that is, processing emotions — it suggests [that] these animals are doing something very sophisticated or complex while they’re processing emotions. And I think also when you look at behavior of dolphins and whales, especially in the wild, you see a level of social cohesion that is really unmatched in other mammals including the humans. Yeah, I wanted to ask you about that. ‘Blackfish’ also indicates that killer whales may have a distributed sense of self. That’s a really interesting idea that’s been around for a while, and it’s gonna be very difficult to test. 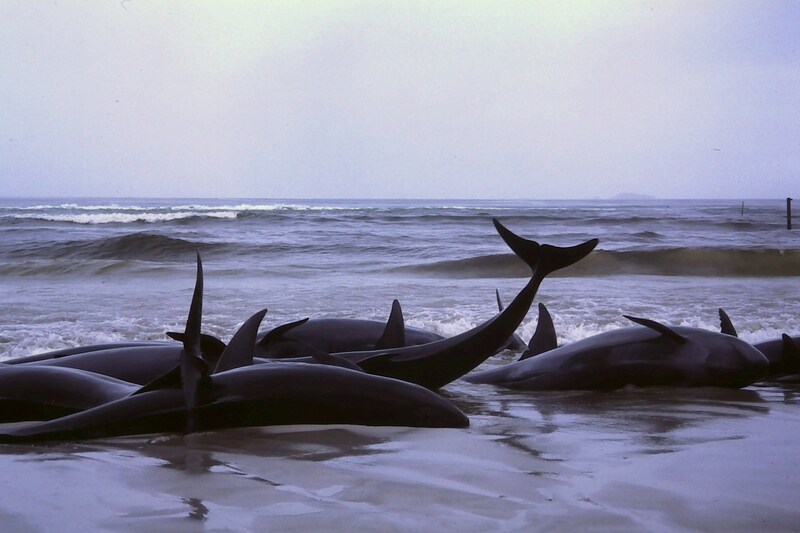 In a mass stranding, a group of cetaceans will leave the water, cast themselves onto the beach, and — usually — die. A stranding might involve hundreds of animals at a time, all alive, often healthy but distressed. Scientists are not sure what causes mass strandings to occur. It suggests there may be something about their sense of self that is not only an individual, but depends very much on their social group. It’s not part of their psychology possibly to sort of disconnect from their social group in the way, say, humans might be able to if we had to. So it’s certainly just, you know, at this point a suggestion. But [it] seems to be descriptive of some of the ways they seem to act that we really can’t explain. When one animal is sick and heads to the shore, why does the whole group do that? Or in the case of [some male orcas], if the mom dies they may die as well. They stop eating and go into some sort of a clinical depression and die. Not all of them but some have. We’ve observed this. What is that? What is that sort of social cohesion they have? Whales beached in Flinders Bay in 1986. From Wikimedia Commons. Are there any other mammals suspected to live in this kind of social group? Ungulates are hoofed animals. For example, horses, deer, camels, rhinos, pigs, hippos, and giraffes are all ungulates. You know, it’s so interesting, because you have to think of where cetaceans came from. They’re ungulates, or they were ungulates. Their closest relatives are the hoofed animals or other herding animals. So, when you look at the cetaceans, [herding] is in there. But they seem to have taken it to another level. If you look at herd animals… it’s not clear there’s the sense of self like there are in dolphins or whales. Dolphins and whales will stand by each other. They won’t leave when there’s a chance to escape. And their behavior is tied more closely to the group than other ungulates or other herd-like animals. Somehow [herding behavior] got ratcheted up, we think, but exactly how that happened or why that happened we don’t understand. It’s like they’re super herds. Maybe this isn’t the right way to phrase this question, but: How “smart” is a killer whale? Encephalization is a technique used to describe the brain. Scientists score animals with an encephalization quotient by measuring the size of their brains and then comparing that to the size of their bodies. A high encephalization quotient means that an animal’s brain is larger than its body size would predict. Humans have the highest encephalization quotient of any species. Some scientists think that encephalization can be used to estimate an animal’s intelligence. That’s a difficult but important and good question. You know, for the longest time I tried to figure that out by ranking their encephalization levels compared to other animals, particularly humans and great apes. If you use that as an inferential scale — or if you use that just to sort of get an idea of how much brain there is per body — you know humans are still the highest. Closely behind are many dolphins and whales, and then great apes, elephants, and a number of animals. So if you look at it from a brain size perspective, or looking at how well elaborated the brain is, then they certainly seem to be right up there. But if you look at their behavior that becomes more of a ground truthing thing. … [In previous studies] they showed capacities in understanding symbolic language, in memory, in problem-solving, in visual perspective. Diana Reise and I showed that bottlenose dolphins recognize themselves in mirrors. They show all of these capacities that are pretty rare in the animal kingdom. And again, when you look at the field work, you see it’s supported by their cultures, their toolmaking, the sophistication of their social networks. All of the lines of evidence converge on the idea that they are these are very intelligent animals. I’m sorry — did you say toolmaking? Yeah! Oh, they make tools! There’s all different kinds of things they do. Humpback whales also use “bubble nets” to catch their prey. And we know now — this is really interesting — that sponge-carrying dolphins tend to hang out more with other sponge-carrying dolphins. It’s called the Sponge Club. It’s sort of the beginning of social segregation based upon the transmission of this behavior that somebody made up, this one female. ‘Blackfish’ also showcases the close connection that trainers have with the whales they work with. How do whales like those seen in the movie perceive humans? You know, that’s something that clearly the trainers have a lot to say about. I’ve worked with captive animals and it’s always a question in anyone’s mind how these animals actually perceive us. I don’t think anyone knows. There are some people that think there is very real intimate relationship, between say the dolphins or the whales and the trainers. But others will say that’s a contingent relationship. I mean, you’re the one that’s a purveyor of reward and punishment and there’s a lot of obvious inequity in the relationship, so who, you know, nobody knows. When you think about the psychology of the trainer and the captive, it’s not a healthy relationship, clearly. Because there’s somebody that has complete control and someone who doesn’t. So the extent that a captive can have, you know, a close relationship with a captor — I’m not sure that can be a healthy relationship in a real sense. ‘Blackfish’ makes the case that Seaworld’s killer whale exhibits are inhumane and psychologically damaging to the whales. What do you think should happen to the killer whales currently in captivity? I think it depends on the individual. There are a lot of individuals that might be good candidates for rehabilitation and release. There are others that are not. The main thing is right now we don’t have any sanctuaries for dolphins and whales the way we have for elephants and chimpanzees and other animals. So there’s nowhere for them to go except back into the ocean, unless we have some way of keeping them in a [place] that is closer to their natural life, but still, you know, not doing tricks and not in a small pool. That’s something that’s really important to develop: sanctuaries for them so that they have options. But some of them I think are releasable with rehabilitation. We just had a bunch of bottlenose dolphins released from rehabilitation and released from a Korean aquarium. They’re now back with their families. It just depends how long they were in captivity, whether they were born there, all of that stuff. Once you takes an animal like an orca and remove them from their mother, their natal group, when they’re like two years old, you’ve done damage. It’s just a question of how that psychological damage will express itself. Anything else that we should know about the movie? I wanted to mention to you something about that scene where they show the orca in the MRI. That actually was not accurate. We never put a whole orca in an MRI. It would never fit. I think they did that to show the public, to help them understand. What happened was that the brain was taken out of the skull, and then the brain was put the MRI, so it wasn’t the whole animal. It’s just a technical thing. If you want to learn more, check out this live Q+A Dr. Marino did after a showing of ‘Blackfish’ at her university. Aviva Hope Rutkin is a science and technology reporter in the Boston area. She currently writes for the MIT Technology Review. She’s performing at StoryCollider in Cambridge, MA on August 27. Follow her @realavivahr. Reblogged this on durito's blog. Thanks, Dr Marino, for the factual nature of this. This time you mostly stuck to your area of expertise. Instead of your usual blanket condemnation of all ‘captivity’, you seem to have finally accepted that not all care of cetaceans by humans is inappropriate, such as those born in built environments, and those rescued from certain death. Where I must disagree is where you deny the possibility of correct inference regarding the authenticity of ‘real relationships’ between humans and cetaceans. Since you use inference in your own work, it is inconsistent and unreasonable to deny the validity of inference in another area, one where you cannot claim expertise. Decades of direct proximal knowledge, drawn from experience you cannot claim to have yourself, has shown that real and meaningful relationships do occur between humans and cetaceans. Consider the recent research on long-term memory, for instance, in this regard. In regard to sanctuaries, I and many others are interested in an open exploration of just what that would look like. Without being open to the evidence that relationships between cetaceans and humans are real, important, meaningful, and critically necessary in any managed care situation, such that humans must be in constant relations with cetaceans under care, and that humans in all their variety provide important creative experiences to cetaceans, the ideal of sanctuaries will be envisioned as you have: without human interaction. This is unreasonable, and lacking in the compassion necessary. Another key question regarding sanctuaries: How do you propose to handle the reproductive ‘rights’ of cetacean ‘persons’ in these sanctuaries? Will you, as all of your frequent collaborators and associates do, claim the ‘right’ to force contraceptives on them, to prevent offspring? Orca present unique challenges to all of us concerned with cetacean welfare. I hope an open, multi-disciplinary, and less combative conversation can be undertaken as we search for ‘best practice’ in dealing with the reality of sharing spaces with them. Of course the relationships between dolphins and humans are real; she never denies that. She does point out that, because of the high level of inequality, that these relationships can not be healthy relationships. Trainers can not be fully trusted on this issue. Certainly they have the ability to develop complicated and deep emotional relationships to the orcas they are working with. Those emotions will lead them to justify their relationships and ignore whether or not those relationships are inherently abusive or not. Certainly the humans care. We also have great examples of slave masters who cared deeply for the slaves they lived with, abusive spouses who have cared deeply for the people they abuse; a high level of emotion does not equate to a healthy relationship. And a relationship where one member is kept in a cage and the other is not, a relationship where one member is denied food until they’ve done what the other person demanded, there is no way in which this is a healthy relationship. Trainers may want to believe the opposite, because to admit the truth is to admit that they are doing terrible wrongs to somebody they care about, but this doesn’t change the simple fact that captivity is a vile sort of abuse. If you disagree, then please volunteer to live in a cramped closet for the rest of your life, only coming out when your master releases you, only eating when your master is pleased with your behavior. As to whether or not imprisoned cetaceans can care for the humans who interact with them, of course it is a possibility. But Stockholm Syndrome is also a possibility. Abused wives and children often deeply care for their abuser. This doesn’t make the relationship healthy or moral. The issue of “complete control” can be understood several ways. In regard to rescued animals or animals born in built environments, it is as much a matter of complete responsibility as it is complete control. For these animals, with nowhere else to go, it is the human challenge to step up to the responsibility to do it right, to provide as much of a life of dignity, safety, health, and opportunities to express innate skills and interests as possible. An intimate knowledge of the work of animal trainers helps one to overcome the easy assumption that all such work is the product of attitudes of dominance and power. For some, of course, this is the case, but one must also spend time in this culture to see how strong is the pressure to eliminate this kind of ineffective and inappropriate behavior. Bully trainers do not last long. Neither the animals nor the other trainers embrace bullying. Your assumption that there is no possibility of a ‘healthy relationship’ begs the question: what constitutes a healthy relationship? If an Orca, born among humans, is not fed, interacted with, challenged so it can use its intelligence and creativities, and allowed to establish consistent relations with a small set of humans who have dedicated themselves to this work, what is to become of them? You deny the validity of the perspective of trainers, suggesting it is fundamentally abusive. I have to ask: what would you call the person who does care for the needs of an Orca in Dr Marino’s proposed sanctuaries? Would they not have to do exactly the same things as the trainers you hold such disdain for? Is there only abuse in the relationship between trainer and Orca? I think one issue overlooked in this is the name ‘trainer’. For many, especially those with little experience working with animals, this automatically is presumed to mean ‘dominator, bending an animal to his or her will’. Try bending the actions of a puppy to your will and you will find that it does not work that way. A common ‘language’ of respect, of understanding, and of shared interest in similar outcomes must exist for ‘training’ to occur. Pure ‘behavioralism’, with all the abstractions of Skinner’s ideas, has shown to not work. This is why relationships must exist, must be supported, and must be part of any program to deal with the vexing issue of how humans are going to deal with the ongoing responsibility we now have to all cetaceans born among us. Perhaps ‘companion’ is a better name, less loaded with the possibility of misunderstanding. Rather than denying that any relationship can be ‘moral or healthy’ in these circumstances, it would behoove us to focus on how to improve these relationships from the ‘best practices’ we know today, into the best practices of tomorrow. The view that these relationships cannot be anything but unhealthy assumes that there are not variations, individualities, personalities, or adaptabilities involved. I reject this view and accept the view that actual, enjoyable, meaningful, and life-sustaining relationships can and do exist between Orca and trainers. Doc dolohin, you over use “regards” and are trying to hard with your wording and vocabulary. Just chill out. Never once did she deny the orca-human relationship. She stated it is probably not a healthy one though. Which I agree to. These mammals are born to migrate and explore. And then they are put in a confining water tank with whistles, tricks, the same food/diet, no hunting, and the only play is with the humans that they can’t even really understand, it’s sad. It’s not really living , it’s being a circus animal and guinea pig at the same time. We shouldn’t be trying to captivate them until we have a better plan on where to store them , where they can migrate, hunt, socialize. Then we can study them and learn from them at the same time. But saving a baby orca from dying just to put it in a tank to suffer, gave its dorsal fin collapse like all the rest, and spend most of its life in s confining cage is sick. You should have let nature take its course and let the orca die not make it suffer. when the humans have finally figured a healthy way the orca can live in harmony among us then good for them , save all the baby orcas you want. But quite with all the low blows and rude remarks. Second: They should not be kept in small tanks (unless perhaps healing from acute injuries.) Water sanctuaries are much, much better. Third: They should be given a healthy amount of food consistently and not based upon their performance of tricks for a paying audience. If these basic, simple, obvious criteria are met then yes it is possible that a healthy relationship could develop as between cetacean & caregiver rather than from cetacean to captor. DocDolphin, you are delusional. The fact that you think anything, let alone an intelligent animal like the orca will enjoy being locked in a small pool most of its life is honestly incomprehensible. I would like to see you put yourself in the shoes of an orca and see how much you “enjoy” it. Why do you think Orcas suddenly turn on their trainers? Obviously because they’re fed up with their lifestyle. No matter how much food you give it or how well you think your treating it, it will always want to return to its natural environment and swim free. Theres no place for orcas in Sea World, and sanctuaries are merely a last resort. Jacob, I have to restrain myself from making fun of the notion of putting myself in the ‘shoes of an Orca’. A nice image, that one. My concerns are for those Orca with nowhere else to go. Born among humans, they have no memories of any ocean. How could they yearn for a return to a space unknown to them? Consider the difference between condoning something, which is to approve of it, and accepting something, which is to allow its existence in your reality. We must accept the reality of Orca living among us now. It is past the time when this could be stopped entirely from happening. I say and have said before, no Orca should ever be captured again. Now, can we move on to the issues facing us as a result of the past? Those in human care now are not starved at any point, and are carefully taken care of by people who know far more than you or I about their needs. They are in relationships with humans that provide them with the best level of fulfillment of natural talents that humans have so far figured out. Exhibiting their behaviours in choreographed scenarios may seem to you to be silly or shallow, but that is your view, not theirs as those who know and love them can attest. Let’s get past the issue of whether they should be among us….this is not possible if we are compassionate people. They are here. We must step up to the responsiblities this entails and do better and better by them as we move together into the future. Remember the cetaceans who have nowhere else to go and you will be facing the actual challenge that must be faced. You said “How can they yearn for an ocean they don’t know of? Imagine growing up in a room that is 15 feet wide, 15 feet long, and an open ceiling. The walls must be concrete, and you can have a couple windows the size of your head. You are never allowed to leave this exhibit, and you get fed if you respond to whistles correctly. Would you accept that as your life? Sadly, this very basic idea of “putting yourself in the Orcas shoes” does a huge disfavor to the orca, as they have bigger brains and in ways are more intelligent than humans. They are moving all the time, as you already know being an expert. These creatures swim 75+ miles a day, and putting the in a couple hundred foot containers does not allow them to travel like they do in their natural habitat. Putting orcas in captivity does not benefit them in any way. Let’s decide that you are right, that captive born orcas are not in a state to be released back to an ocean they do not know. But you say that we need to accept orcas now living amongst humans – do you at least agree that orcas should no longer be bred in captivity – as such a day without orcas in captivity would be on the horizon. Would this be a good approach to you? The issues involved in providing humane care for cetaceans are not simple. Ending ‘breeding’ does not address the social and psychological needs of cetaceans, whose social lives are very much centred around reproduction, rearing, training, and sharing with offspring. Advocates of ‘sanctuaries’ state that they want to treat cetaceans with all due care, giving them the best, most humane lives possible, yet also say they want them all to die without offspring. Some cetaceans have crossed the invisible line between wild creatures and those we call ‘domesticated’. This is, I know, a weighted word, one that carries heavy meanings for many people. Consider this: no two animals considered domesticated arrived in that condition the same way. Each has had its own path across the line into human care and companionship. It is a momentous time for us, as humans, to have to step up to the responsibilities involved in caring for such extraordinary lives. I think that many who oppose all human care for cetaceans are missing the point, missing the opportunity, and have little interest in the special moment in history in which we are living. Look at this too: among those whose lives are dedicated to cetacean care, great effort goes into managment of reproduction so as to keep the genetics healthy and to prevent the need for more captures to do so. Yes, ‘breeding’ helps keep dolphins from being captured. No, I did not say what you quoted except for the first sentence. My concerns are not for putting them into captivity, which we can agree is not right. My concerns are for those who have nowhere else to go, having been born among humans, or having been living among humans for so long they don’t have the capacity to ‘return’ to an ocean that would kill them quickly. Orca present a unique set of problems for those who care for them. Their aggression (as very potent hunters who eat most anything they can find), their size, their exercise requirements. They now live in the largest pools humans have made for cetaceans and larger pools are being designed and are under construction now, in hopes of providing them with better accomodations. To say they swim “75+ miles a day” means little. A horse living wild will run many miles per day, while a horse living in human care does not. Both can be quite healthy. Why would an Orca swim 75+ miles per day? Mostly to find food. Let’s stay focused on how to best treat those who have nowhere else to go. cetacean does not equal marine mammal. cetacean does not equal seal. seal does equal marine mammal. Thanks! Edited to be more specific. If killer whales and dolphins have such a complex emotional section of the brain, are they capable of forgiveness? Assuming they know/ understand everything we’re doing to them (i.e taking away their calfs, making them perform, etc) and their brain being so emotionally complex, is this a possibility? After reading the comments my question is this. A trainer at SeaWorld is in no way like animal trainers in zoos or places where the animals get to be in a mimicked natural habitat. They are teaching them skills to get along better with humans like a dog trainer is. Instead there teaching them the trivial tasks of jumping through hoops like they are small brained and unintelligent when we can all see that they are not. This is why my personal opinion is that the relationship is not a healthy one. And the trainers seem to not be fully trained either which is even a bigger injustice. We need to look at the options because what’s happening now is deplorable. Wow this is pretty intense stuff, I have no doubt that we share this planet with this sentient, intelligent (although perhaps a different type of intelligence than we’re used to) creatures. Blackfish makes me sad, but we also keep humans in captivity too. The dolphin brain is even bigger than the human brain. It’s very difficult to study.very nice research you done. Its very difficult to research for dolphin’s brain.This is very great research you done. Its sounds like very interesting to be inside the mind of killer whale biut its quite difficult to know about it perfectly. All very interesting, but to suggest in a discussion in one vast and infinitely complex social institution, the media [one ‘social’ institution among many many others of similar complexity], that whales are more social than humans is pretty ironic. And stupid, really, considering that she is an expert who should have the ability to reflect on what she is saying. I’m not sure why but this blog iis loading extremely slow for me. Glad to have stumbled across this article! Couple of things after reading through the comments… IMO, you can’t breed the innate characteristics out of these animals. This is especially true considering the marine mammal captive industry has only existed for the past 50 years and orcas have developed their characteristics over the millennium. Interesting that we readily admit that we can’t breed the ‘wild’ out of wolves, monkeys, big cats and other animals (such the caution surrounding keeping them as house pets) but when it comes to orcas, the industry and pro-cap folks would like us to believe that being born in or spending years in captivity somehow reduces or eliminates their natural characteristics, like suddenly they’re not going instinctively want to swim far, dive deep, maintain close family ties, use their natural communicative abilities and the like. At the same time, they also want us to believe that these miraculously ‘tame’ animals who are suddenly well suited for captivity are a major benefit to their wild counterparts. I agree that ‘trainers’ and their captives can indeed develop ‘relationships’… just as a previous commentor mentioned that slave masters developed relationships with their slaves; however I believe that if given the choice, dolphins would rather swim wild… feeling the ocean tide, eating live prey, developing lifelong social bonds, etc. I also disagree that marine mammal captivity is or even should be here to stay. If Ringling Bros can phase out their elephant show, the same can and should be done for marine mammals. We know a lot more about these beings than we did when these water circuses started cropping up 50 years ago, and perhaps the solution isn’t to look for ways to improve their lives in tanks but rather for US to become the caretakers we’re supposed to be and find ways to transition them into more humane environments and eventually phase out marine mammal captivity altogether. These animals are what they are… and we would/should no more keep an orca in a tank as we would keep a cheetah on a leash. Time to evolve. Ringling Bros circuses may stop having elephants travelling, but the elephants still live in human care. Why not look for ways to improve their lives? Isn’t that the first thing we should be doing? What is a ‘more humane environment’? Define that. Is exposing them to ocean pollution, pathogens they have no immunity to, and very little human contact ‘more humane’? This is what most ‘sanctuary’ models look like. Phasing out marine mammal captivity sounds like a worthy goal, but is it? Can it be done without more harm to individual cetaceans? I see a lot of wishful thinking and high ideals with little forward thinking. Let’s find a way to help them be the best they can be and accept that some cetaceans have now become part of the world we share with other animals wholive in close relations with humans.